Travis accomplished steady results in his high school weight room, then pursued fitness after he graduated. 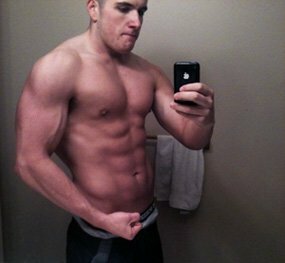 See how he lost 72 pounds and 20% body fat! 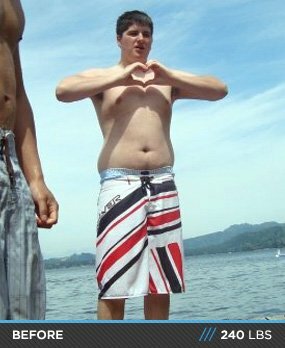 I was always overweight and never really bothered to do anything about it until my later days of high school. I worked out on and off in a strength and conditioning class in high school and always enjoyed improving on my lifts week to week. Growing up I have never been happy with the way I looked in mirror but, like I said, I never really attempted to change this. That is until I started seeing results from my strength and conditioning class; then it truly became an addiction. Towards the end of high school a few of my friends decided to get gym memberships and I decided to step up and make a change, and from that day on I never looked back. I spent hours upon hours in the gym every week and it was arguably my favorite time of the day. I loved the competition I had with my friends seeing who could lift the most weight and make the biggest improvements every week. Knowing that I can achieve a more aesthetic physique every day is what really pushes me; I found it unbelievable to see what your body could do day to day week to week. Working out has been the best decision I have made in my life not only for my health, but for my appearance and confidence as well! Nothing feels better for me than looking back at my old pictures from high school, or seeing the looks on my friend's faces that I haven't seen in years, that is all the motivation I need. When I first began working out I was doing a 3 day split that my P.E instructor taught me to do in high school. I used this split for the first few months of my lifting because I really didn't know anything else. 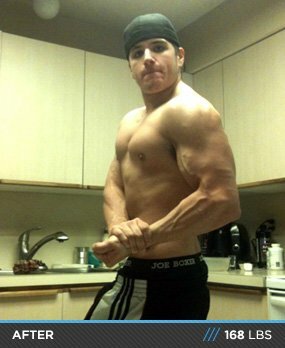 Soon after I got my gym membership I found bodybuilding.com and started lurking in the forums on a daily basis. My days began to consist of school, gym, and research. I began experimenting with various routines such as my 3 day split, 5 day splits, and even a few 6 day splits trying to bring up lagging body parts. I spent hours looking into proper nutrition and diet plans doing trial and error to see what worked best for me. Soon after looking through the nutrition section I couldn't believe how much I had learned, and I applied as much of it as I could to my daily diet. Once I found out what worked best for me with diet and training I felt like nothing could stop me. The gym became the highlight of my day and I spent most of my morning getting prepared for the workouts. Overall the biggest factor that added to my success was definitely my dedication, there were many nights where my friends would go out partying and I would stay in just to avoid the temptations of drinking. I also work in a restaurant where it was very hard at first for me to avoid eating the various foods that were around me during my shifts, so I began bringing bags of chicken breasts and almonds while all of my friends laughed at me, but that didn't bother me. Consistency was key, once I got in a rhythm of healthy eating it was easy for me, it was all about turning good days into good weeks which made it hard for me to fall off my diet. Over my years of training I have tried various supplements but these are the only ones I use as of now. When it comes to my diet I have tried many different ways to shed the fat. I spend a majority of my time eating high protein, moderate low-gi carbs, and low fat, this got rid of a majority of my weight. For the later end of my cutting I used many different dieting protocols from SciVation. For anyone looking to lose that last little layer of fat I HIGHLY recommend looking into their diets. For the later part of my cut I used a low carb approach with refeeds every third day. My training was pretty much the same over the whole period with different workouts thrown in to avoid plateaus. 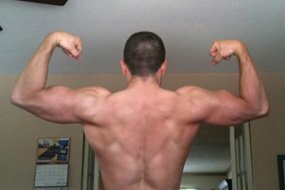 I worked out primarily on a 5 day split - Chest, Back, Shoulders, Arms, Legs, Off, then Repeat. As for my abs training I would usually throw in a short 10-15 minute circuit at the end of every third workout. This circuit consisted of decline sit-ups, ball crunches, leg raises, and torso twists. For cardio I would usually throw in a 20-30 minute medium intensity session 2-3 times a week. Diet is huge. (If you're just training and not actually eating properly to support this training you aren't getting everything you can out of it, diet plays the largest role in changing your physique.